Biffa will invest £250m in new infrastructure following the takeover of the firm last week, according to its chief executive who said the firm’s financial future has been secured. 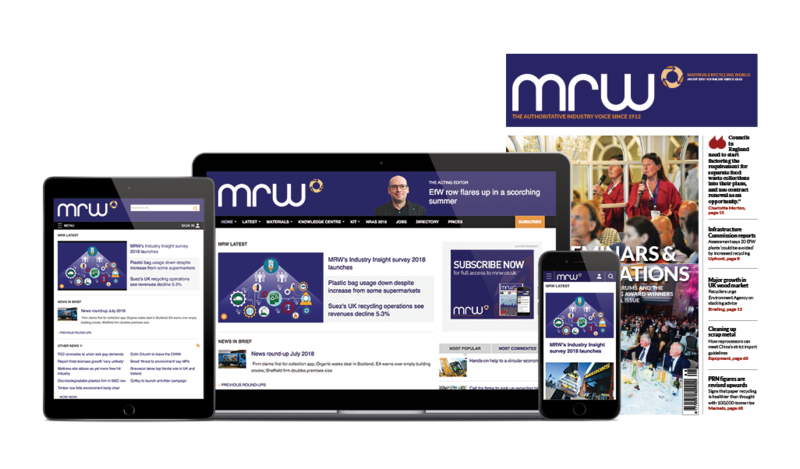 Ian Wakelin told MRW he was “delighted” by the recapitalisation deal which will see four of its lenders swap debt for equity and inject £75m new investment into the firm, writing off around half its billion-pound debt. Wakelin, who built up the Greenstar recycling firm and took over at Biffa following their merger in 2010, said he was glad to have the “unsustainable debt” reduced and the opportunity to invest in new infrastructure. Biffa could see “potential substantial growth in the coming years” in its commercial and industrial (C&I) collection business, said Wakelin, once it develops new recycling and energy facilities. Biffa plans to invest around £250m over the next five years, including £30m into new large C&I recycling facilities, with the £75m new investment topping up the firm’s existing £50m a year capital expenditure. Wakelin said the 100-year-old business would build new sorting and separation facilities to increase recyclate extraction from its collected commercial waste, and new refuse derived fuel (RDF) or solid recovered fuel (SRF) production capacity for selling into the global market. Biffa’s struggle with crippling debt came to a head over the past year, and in January its private equity owners, Global Infrastructure Partners and Montagu Private Equity hired Goldman Sachs to “scour the sector for consolidation opportunities”. Analysts had speculated about a takeover by one of Biffa’s rivals, bringing some consolidation to the market, but Wakelin refused to comment that or the rejected £520m offer from US EfW firm Chinook Urban Mining. And he hit out at “completely and utterly unfounded” criticism from within the sector that his team had failed to effectively realise synergies following the acquisition of Greenstar in 2010. “I founded Greenstar”, he said, “so its ethos and its belief in recycling, we brought to Biffa. But what you need to effect that is the underlying infrastructure. He similarly rejected criticism in the press that the firm had failed to diversify beyond the old landfill business quickly enough: “We operate three of the largest recycling facilities in the country, and the country’s largest anaerobic digestion plant which opened the back end of last year, and we operate one of only two high-density polyethylene plants which take a milk bottle, wash it, clean it, and turn it into another milk bottle; we‘re building a MBT facility for West Sussex County Council. But Biffa would not be investing heavily in large scale EfW incineration plants, Wakelin added, because there was no need for it with the capacity already planned in the UK and Europe.